Rabbi Bernard Drachman was a man of religious convictions. While he recognized that the old Orthodox ways necessarily had to be adapted to the new American lifestyle; he stood solidly against the disposal of crucial religious traditions. In the second half of the 19th Century, established Jews began leaving the Lower East Side, moving their congregations uptown to the Yorkville neighborhood. 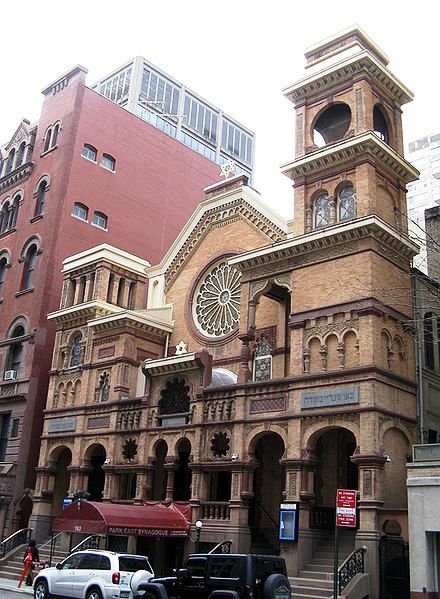 One such congregation, Beth Israel Bikkur Cholem which was founded by Polish Jews in 1847, build a new synagogue on Lexington Avenue at 72nd Street. Drachman was elected rabbi in 1887. It was not a good match. Despite the rabbi’s virulent stance, the congregation voted to adopt the change. Rabbi Drachman sadly walked away from his leadership of the synagogue. The disheartened rabbi received a visit from his father-in-law, the wealthy real estate mogul Jonas Weil. The two were founding members of the Jewish Theological Seminary a year earlier. Weil encouraged Drachman to found his own congregation in which he could foster his own combination of Jewish Orthodoxy and Americanism. Weil offered the financial backing necessary and, after all, the Rabbi already had a pile of letters of support from Jews across the city who knew of the conflict that initiated his resignation. By 1888 Drachman had organized the new congregation and a year later a constitution was written and adopted. Drachman was named rabbi for life. On November 29, 1889 the cornerstone was laid the new synagogue. Because Weil and his brother Samuel paid for the new building and the land, the congregation took the name Zichron Ephraim, “Memorial to Ephraim” in memory of their father. German-born architects Ernst Schneider and Henry Herter were given the commission to design the structure – a significant departure from the tenement buildings they more commonly built. In addition to the 60 by 90 foot main structure, a religious school, prayer room for daily worship and a tabernacle were included in the plans. As with many other synagogue of the last quarter of the 19th Century, a loose mixture of Byzantine and Moorish Revival style was used -- Gothic Revival smacked of Christian churches. A pronounced porch composed of horseshoe arches and pillars supports two impressive towers (even more impressive at the time when they were topped by onion domes). A large rose window dominates the central, angled gable and harmonious mixing of terra cotta and orange brick in exuberant details creates a visual delight. A year later on September 7, just one week before Rosh Hashanah, the synagogue was dedicated. The building cost approximately $200,000 and at its opening the membership was comprised of about 100 families . There was seating for 1,000 worshippers – 550 men and 450 women. Rabbi Drachman served as rabbi for more than half a century, dying in 1945. Throughout the decades the synagogue continues to be strong and positive force in Jewish education and religious life in New York. 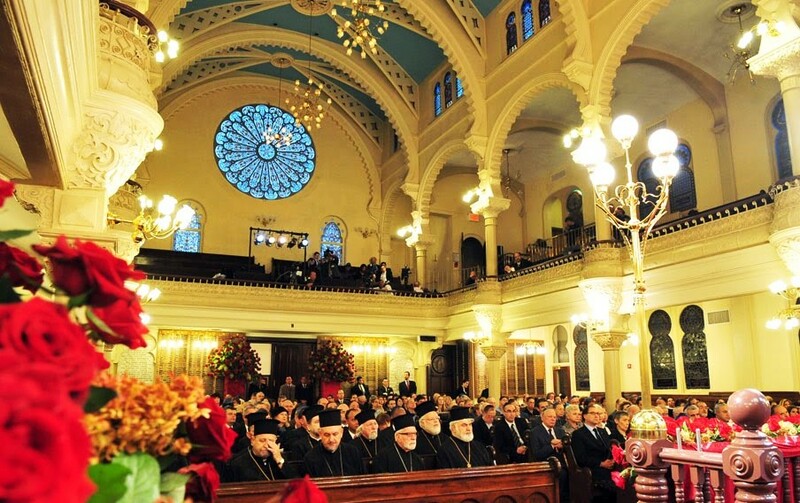 The synagogue has been a destination for leaders from across the globe. In 1957 the Lord Mayor of Dublin, Robert Briscoe, visited and prayed here. In 2008 Pope Benedict XVI made the first papal visit to an American synagogue (he left with a box of matzah) and in November of the following year the Greek Orthodox Ecumenical Patriarch Bartholomew paid a visit. 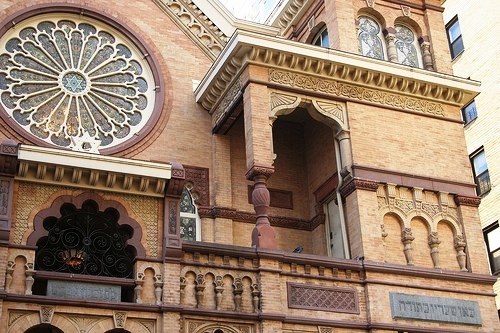 The beautiful synagogue which came to be because of one man’s religious convictions was designated a New York City landmark in 1980.